All you need to fly, to soar in the sky with the sun. Gah.. spent so much time with this. ;_; Even more than that other Sora pic I did. &amp;amp;amp;gt;.&amp;amp;amp;lt; I mean, the first sketch I did of this took me 3 hours, and I spent another 3 hours coloring in Sora.. only to trash that pic and redraw it. ;_; Guh. Anyway, it's for a contest on the Kingdom Hearts Ultimania site. The theme was "Using any medium you wish, draw your favourite character(s) from the Kingdom Hearts Series on vacation in an interesting style." 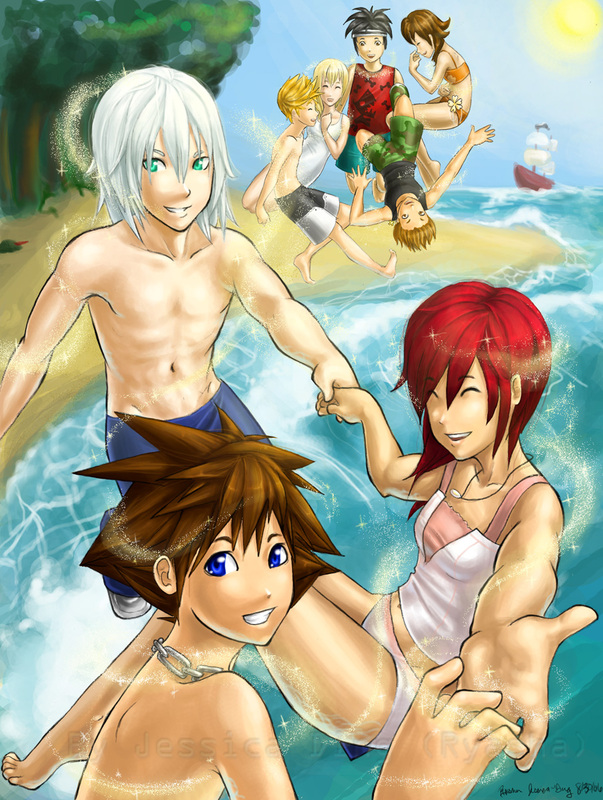 So I put Riku, Sora and Kairi in Neverland. =3 It takes place after KHII. I figured they'd need a place where they could just relax and be children again. =3 And then I felt bad for Roxas, so I stuck him and his friends there in the back. Yeah.